Our 6 seater dining room sets are perfect for a lazy afternoon tea, a manic Sunday dinner or simply spreading out the newspapers over breakfast. Many of our tables are extending dining tables, which makes them space-saving on a daily basis, but flexible if friends drop by for a catch up. Our newly launched dining room furniture range looks as chic and pared-back against a sleek kitchen design as it does against an oak framed dining room. Whatever your indoor space, these stunningly designed 6 seater dining setswill provide a focal point for your kitchen or dining room. Our extending dining tablesare made of strong, resilient aluminium. Some have a toughened glass table top. They are all easy to clean with just a damp cloth, making them the perfect table for families. We have a wide range of 6 seater dining furniture. Whether you like the sleek lines of the Chloe with its aluminium and matt glass table top, the steely Florence in grey, or the pared-down simplicity of the rectangular, non-extending Martha, we like to think we have a furniture set to suit you. 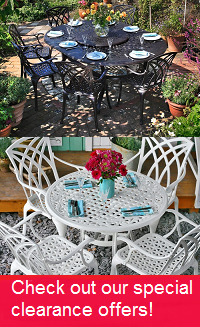 All of our 6 seater tables come complete with matching modern chairs made of aluminium and hard-wearing mesh fabric. If you would like to know more about our new range of dining room sets why not order some samples? These show clearly the different colour finishes as well as the fabric options.